What a crazy season it's been already. I always find ways to keep myself busy and on the move. I've been down to California four times already, as well as to Florida. 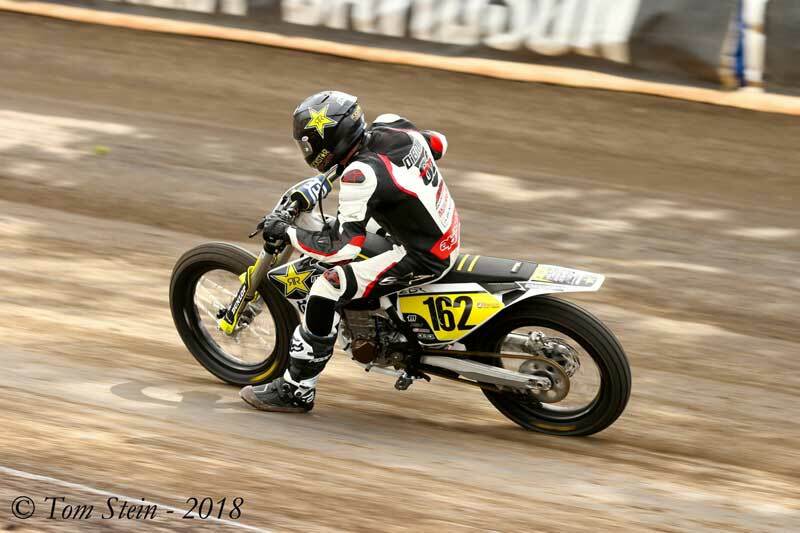 Which brings me to my first subject, I went down to Daytona Beach, Florida, and made my American Flat Track Pro Singles debut at Daytona International Speedway! I've always wanted to race there, didn't matter what it was. I had been saying I was going to go every year for the last 4 years. With only a few days to spare before the first round of the American Flat Track series, I made the last minute decision to go and booked plane tickets. My friend Davis Fisher had a 2018 Honda CRF450R there waiting for me. Out of 63 entrants, I qualified 17th, about a second off from pole position which was good! Especially for only getting 4 laps of practice on a bike I've never rode. I got 5th in my heat race which was awesome, since I started 6th. I easily moved into the Semi, where I had to finish 9 or better to make the main event. I got a great start in that and found myself battling for 3rd out of the first corner, but the race got red flagged. It restarted and got red flagged a couple times actually. On the final restart, I got a bad start and was outside 9th place. I battled my way back into the final transfer spot just before the white flag lap, but made a mistake and lost the spot on the last lap. I just missed the main event which was a bummer, I was riding well but just made a small costly mistake by coming in too fast into a turn and pushing wide. All in all, a really good experience and a lot of fun! Moving forward from that, I raced my new Latus Motors Harley-Davidson Hooligan bike for the first time at Super Hooligans round 2 in Perris, CA. I showed up with no practice on the bike, at my least favorite track on the series, and got a 3rd place! I was really happy with that considering I came from about 7th position to work my way up to that podium spot in the main event. The bike worked amazing, and I can't wait to get some more time on it! The Oregon Motorcycle Road Racing Association series (OMRRA) started back up too. This year is the first year I had not practiced on my road race bike at all leading up to the first round in April. I had been off my Yamaha R1 since October. This was the longest period of time I've been off a road race bike since I started road racing in 2008. For many reasons, I wasn't too excited to go road racing at PIR again. After losing Kelly Johnson there last year, and my closest friends not racing anymore, it was just hard to be in the spirit. But all that changed as soon as I threw a leg over the bike and got out on the track. I was quickly reminded of why I love road racing. The weather was threatening all weekend at OMRRA round 1. Saturday we got dry races, I got two 2nd place finishes. I literally got beat by a tenth of a second in both races, just missing the win. I rode smart though, and was arguably the fastest rider. On Sunday the rain came, and I got another 2nd place in the early afternoon Formula Ultra race. I don't have a lot of rain riding experience on a 1000cc bike, so I took my time learning and then starting closing the gap on the leader fast. Couple more laps and I might have won. But I did end the weekend with a win in Open Superbike! I closed a 5 second lead in the soaking wet track to make a last lap pass for the win. And I also left the weekend leading the OMRRA Overall Championship, which was a great start to defending my #1 plate. OMRRA round 2 was last week, and I was on fire winning all four of my races! The weather was perfect all weekend long, and the pace was fast. I clicked off 1:06 lap times every race, dipping down to a 1:06.4 a few times. I won every race by a tenth of a second or less. Had some amazing battles with Jeremy Coffey. Last weekend was a ton of fun, and I extended the Overall Championship lead of mine. 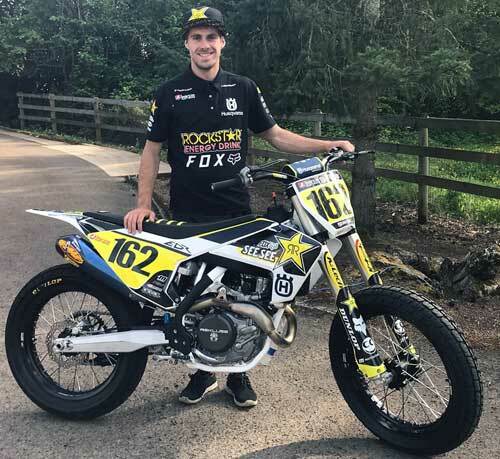 Something really cool that came up not too long ago was a new sponsorship with Rockstar Energy Drink! Energy drinks are the hardest to get sponsored by, and it's been a dream of mine for as long as I can remember to be sponsored by one. Rockstar in particular the last 5 years or so. The helped me out big time by getting me a brand new Husqvarna FC450 to race select American Flat Track rounds at! It was a scramble to get the bike ready for my first race on it at Calistoga, CA. And the debut on it wasn't impressive, but to my credit the suspension setup was wrong and we had so much to learn in such little time. Despite getting a bruised ego, we actually learned a lot that will help me at future races, so it was worthwhile taking the beating! The bike is stock, so hopefully after the Sacramento Mile or Springfield TT, I can get the motor built. One thing we learned at the Calistoga Half-Mile is that my bike down on horsepower against the top racer's bikes. Anyway, the AFT races and my new bike is a work in progress, but I know we will get it figured out! Last thing to update you all on is that I've been riding some motocross lately, and I also switched to a Husqvarna for that too. I absolutely love the new Husky's! It's been such an easy transition and quite honestly, I've never been so comfortable on a dirt bike and mine is stock! 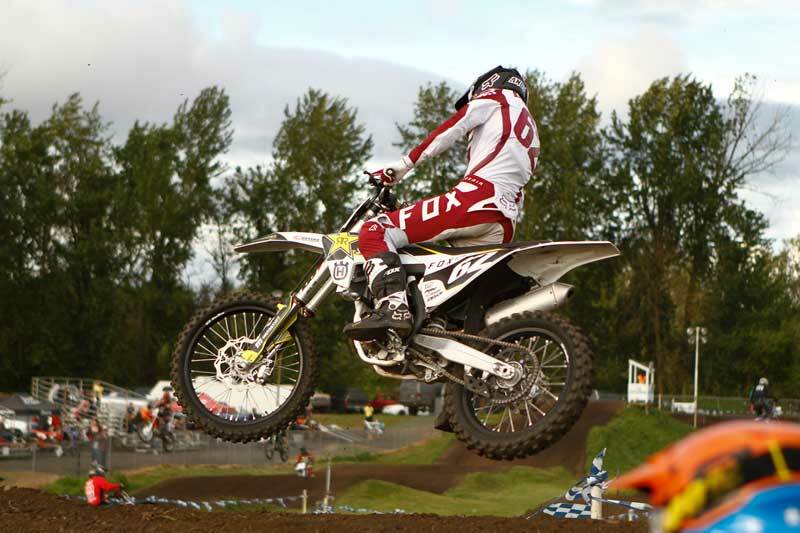 I moved up to the pro class at Thursday Night Motocross, which runs at Portland International Raceway. I got 4th out of 12 in a pro moto which I was very happy with! With some more practice, I think I'll start making some money out there on the mx track this summer! Back to getting ready for my next race now!